Cecilia has every reason to believe the desperate Mrs. Meacham’s diagnosis of the decay of Laycombe’s eligible young men. Lord Wickham (aptly named to prejudice the reader), with his wealth, elegant dress, world-travel, and reclusive behavior, seems to be just the kind of man who would drag Martha and Alice Meacham’s Mr. Dallon and Mr. Wideman to gape at Egyptian dancers in a seedy tavern night after night. In the midst of her crafty campaign of makeovers and matchmaking, Cecilia encounters more challenges than she ever has before. Plus, Lord Wickham proves a more enigmatic figure than she anticipated. Are his days really wiled away in dissipation? Does he really despise all women because his first wife ran away with a merchant’s son? Or is he actually the perfect match for Cecilia? Now, she finds that her no-nonsense, unsentimental approach to marriage is in direct conflict with her feelings. In more than one breast, sense is at war with sensibility. Joan Smith has written a lovely novel. Her heroine is compelling, her hero is surprising, and their interactions are interesting and believable. Secondary characters are given quite a bit of attention, especially Martha Meacham and Henley Dallon. 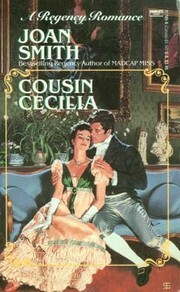 Smith’s characters’ conflicts and tensions are not limited to the misunderstandings between Cecilia and Wickham. A few celebrity appearances spice up the sleepy, pastoral scene. If I were to identify the likely sources for Cousin Cecilia, I’d point to Georgette Heyer’s Annis Wychwood (Lady of Quality) and Jane Austen (clearly, Smith draws upon several of Austen’s novels). Although very chaste, the chemistry between the characters is excellent and the story believable. If I can find fault with anything, it would be that once the leads know their own minds, it takes a rather long time for them to come to a mutual understanding. Of course, that is far better than a rushed or contrived conclusion. So, in summary, Cousin Cecilia is well worth reading. I look forward to checking out more of Joan Smith’s works–which is fortunate, since the last shipment of regencies I received contained several dozen of her books!